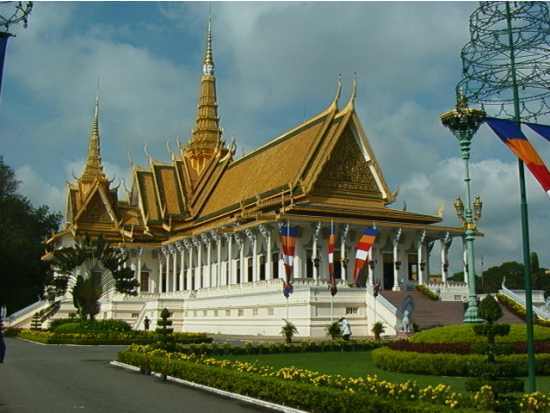 Cambodia was the heart of the Khmer empire that flourished during the 8th to 12 centuries AD. 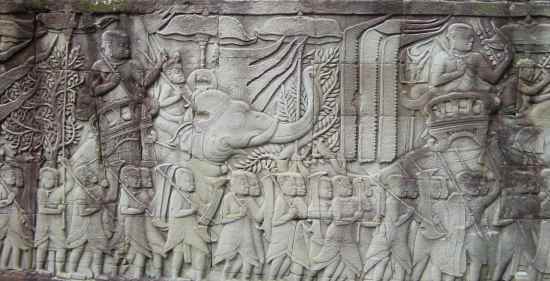 It covered modern-day Cambodia, much of Thailand and Laos, but waned in importance as the Europeans established colonies in southeast Asia. This is the nearest town to Angkor Wat and many other palaces and temples. The sites are spread out over 20-30 km so transportation is needed - we found Thy, a Cambodian soldier moonlighting as a driver at the airport, and this turned out to be one of our luckiest breaks of the trip. He would pick us up, listen to our plans, and politely suggested an alternative that took better advantage of light and promised smaller crowds. Others used scooters, motorized rickshaws, or tour buses - all seemed to work out OK.
Bas reliefs - On our first visit, we arrived with an afternoon shower, and huddled with others in a 'library', an out-building with a good view of the main buildings of Angkor. When it slackened we spent the rest of the afternoon examining the marvelous bas reliefs that had been carved into the outer corridor. Each wall is approximately 150 meters (500') long, and has thousands of figures representing gods, demons, warriors, mythical animals, and battle scenes. That this art has survived nearly a thousand years for us to view is amazing, and our hats are off to the French archeologists who discovered and restored what they could, and to the Cambodian government that is trying to preserve this priceless site. Inside - The world's largest religious monument, this 12th century site is believed to represent the Hindu universe, with a large moat (150 m wide) surrounding a city, and a temple complex in the center. Causeways cross the moat and lead through large gates, and balustrades on each side are built to represent Nagas (multi-headed snakes) that seems to be a recurring theme in the Angkor Wat artwork. The temple represents the sacred mountain of Meru, and as we entered and eventually climbed the to the top, it did feel like climbing a mountain. Clearly no large processions marched to the top - more likely a few monks or religious leaders slowly made their way up the very steep steps, handrails now provide some safety for the many tourists. We could go on and on about the site, but we would be repeating words from the many good guide books available. 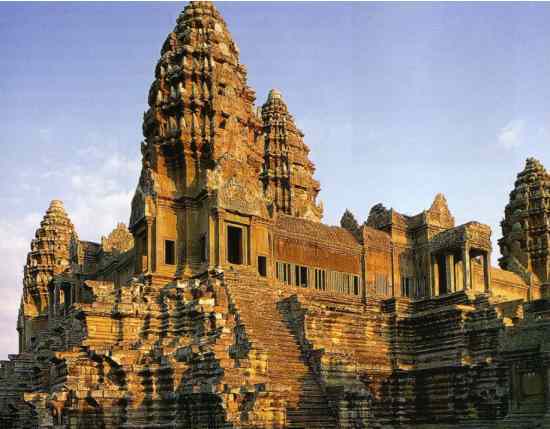 We used 'Ancient Angkor' by Michael Freeman and Claude Jacques, and found it to be an excellent reference. We have used several of their photos on this page, until ours are developed. Sunrise Viewing - One evening we had dinner at the Red Piano, a funky restaurant with good beer and western fare. At the next table, a group of tourists were huddled around a laptop, viewing digital pictures that they had taken at sunrise (and before) so we committed to do the same. 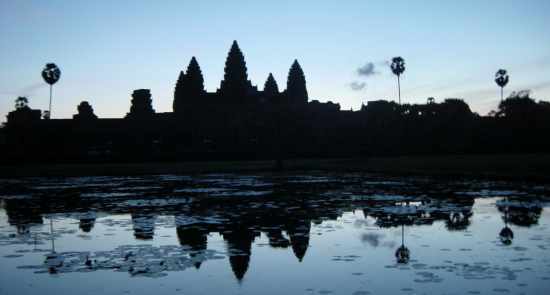 On our 4th day, the alarm buzzed at 0450, and by 0515 we were on our way to a sunrise rendezvous with Angkor Wat. The morning was cool, and we, with 25 diehard photographers, roamed the edges of the lake in front of the temple, seeking a prize-winning shot. Perhaps no prizes for this one, but we had a good time. Sunset - We tried several times (along with hundreds of others) to capture the magic of the towers at sunset, but cloud cover thwarted our efforts until the last day. From the top of Phnom Bakheng we joined scores of others with telephoto lenses, and captured the golden glow on the towers as the sun broke through the clouds just before sunset. Bayon - a large State Temple built for King Jayavarman VII in the 12th century. 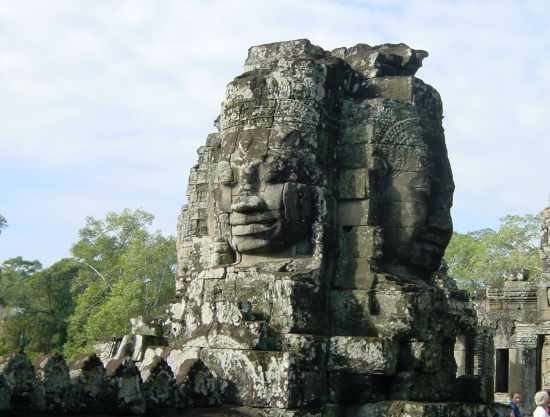 This one is distinctive because of its many towers where the same face is carved on all sides, over 200 faces in all! The temple has an outside wall almost 150 m on a side and an interior temple with towers, galleries, corridors, and libraries. 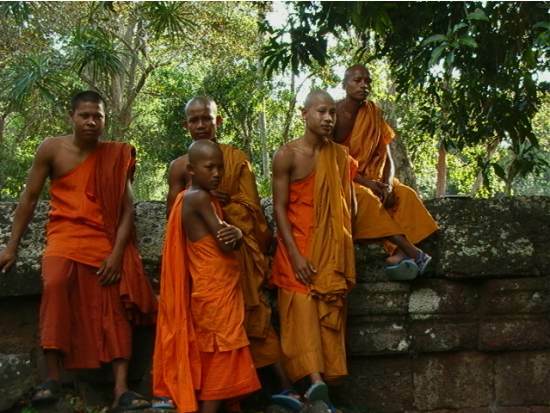 Like many of the temples, it has been remodeled over the centuries as kings changed it to meet their whims. Many rooms have bas reliefs or offering platforms with burning incense sticks. Overall, this was a very distinctive site. Elephant Terrace and Leper King Terrace - The Elephant Terrace is a large open ceremonial areas that faces the Royal Square, a large reception area for pavilions where visiting royalty could be entertained in style. The terrace walls contain scores of carved elephants, garudas (mythical man-bird figures), five-headed horse, and other figures. The Leper King Terrace stands to the side, and has more detailed bas reliefs of Buddha and others. Phimeanakas - a relatively small 10th century royal palace in the shape of a mountain, we climbed to the top for a good view of the surrounding ruins. Bapuon - is a massive mountain-temple that is currently under renovation, and our guide suggested it was not worth visiting at the moment. Banteay Srei - A delightful 20 km drive through the country-side gave us a gentle introduction to rural Cambodia as we passed small villages, houses on stilts, rice patties, and water buffalo resting in the fields. The temple at Banteay Srei is somewhat far from the madding crowd, and it was very peaceful walking through the thousand-year old buildings. The carvings were awesome and the entire site was beautiful. It is quite small and intimate and was a good introduction to the kind of artwork we could expect for the week. This is definitely one of the 'must-see' sites of the area. Banteay Samré - Returning towards the main concentration of ruins, we bounced over a 1/2 km rutted side road to Banteay Samré, an small isolated temple that has been very well restored. The big tour buses seem to shun the poor road, and so it was very peaceful and one could wander everywhere without bumping elbows with other tourists. Inside the temple a quiet and friendly man who had lost a leg provided information and scrambled through the ruins just as well as we able-bodied tourists. Pre Sup - This was our first 'mountain temple', a small complex where that has been built up to resemble a mountain with a temple on top. Unlike mountain structures like the pyramids of Egypt and Ming Tombs of China, these do not conceal hidden chambers and treasures, they seem to be designed just to create a mountain on what otherwise is very flat countryside. Ta Phrom - Perhaps our favorite, the French archeologists decided to leave this one un-restored, and did just enough to make it reasonably safe. 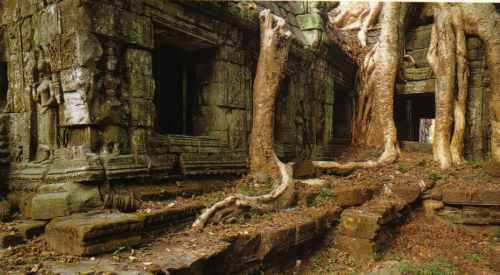 It has trees growing out of the foundations of buildings, and bushes in the courtyards. It had long paths leading to the palace, and one could almost imagine the awe that the French must have experienced when they came upon these magnificent buildings. 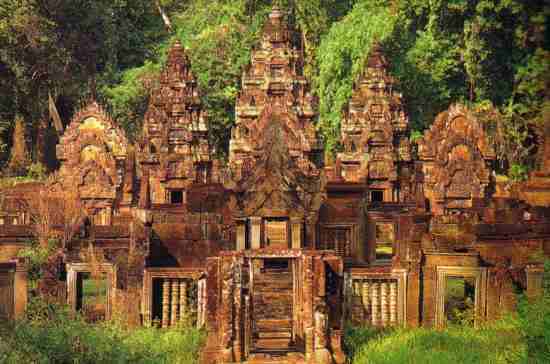 Roluos - This concentration of three palaces was a 12 km drive to the south, and consisted of Bayon, Preah Ko and Lolei. Each was very attractive in its own right, but Bayon was the most impressive, and was the first 'mountain-temple' to be built. 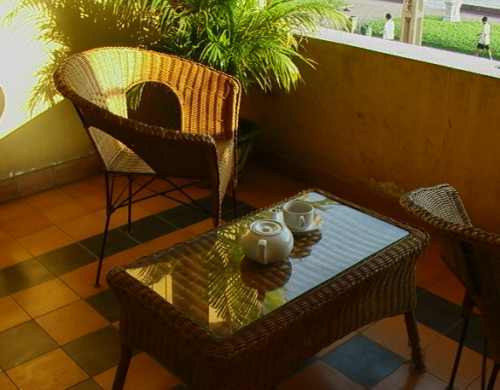 It is a combination of lava stone, sandstone, and brick, perhaps from successive remodeling. Shadow Puppets - Judi had been looking high and low for a puppet show, and the Bayon Restaurant offered dinner and a show for $11 and we had a blast. The Shadow puppets were controlled by children, aged around 8-12, and although the dialog was in Khmer, the story-line was quite clear. Tonlé Sap - This river from Siem Reap to Phnom Penh, bloats during the rainy season and turns into a lake 150 miles long and 25 wide - water that backs up from the Mekong that can't get to the ocean quickly enough. This provides water for irrigation, and makes the land very productive. We took a tour from the riverport in Siem Reap, through small Cambodian and Vietnamese fishing villages that were about the poorest we have ever see, with virtually nothing in the way of material goods, but still a lot of smiles. Day 1 - Arrived midday; Cultural Dancing on the lawn in front of the Grand Hotel d'Angkor under the stars , starting with a glass of champagne and culminating with scenes from the Indian epic, the Ramayana. Day 5 - Sunrise at Angkor Wat (2 hrs), Preah Khan, Preah Neak, Ta Som, and East Mehom, (2 hrs), back to Ta Phrom (1 hr), lunch, boat cruise on Tonlé Sap (2 hrs), Phnom Bakheng for sunset views of Angkor Wat. Two days earlier we had bought our tickets, and committed to ride the fast ferry to Phnom Penh - a trip that any safety-minded person would probably avoid like the plague. 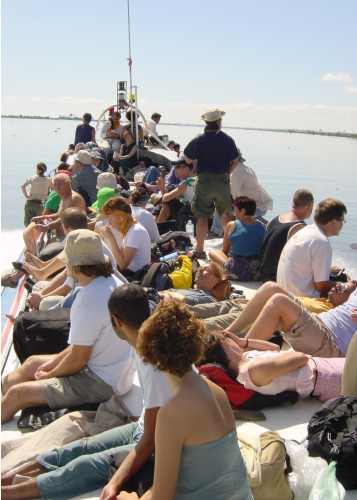 The bullet-shaped vessel had room for about 150 people inside, with narrow seats and no storage space for your luggage. The only exits were 2 narrow doors in the bow that must have seemed like a mile away for the people seated in the rear. The adventuresome folks rode on the roof, a flat space in the glaring sun with rails 6" high. The path to get there was along the side deck, a 12" walkway only inches from the water speeding by at 30 mph! And of course, no safety handrails. But we all survived and it makes for a good story! This is the capital city, with a population of about a million, and a host of very poor people and many injured amputees from the many conflicts that Cambodia has suffered during the '60's, '70's, and '80's. Foreign Correspondent's Club - We stayed and ate at this well-known spot, not the cheapest in town but it has great atmosphere and a wonderful view of the Mekong. National Museum - This has an interesting collection of Angkorian and pre-Angkorian artifacts, but no information about recent events such as the American bombing, Khmer Rouge and Pol Pot regimes, Vietnamese invasion and the like. Royal Palace - A short walk from the hotel and a stone's throw from debris-littered streets, the palace was opulent, but a little run-down. While we were there, the 3rd World Buddhist Conference got underway and representatives from 20+ countries competed with us in the museum queues, and caused massive traffic tangles as the police blocked off streets to let the buses of delegates make their appointments on time. Killing Fields - We elected not to visit the killing fields, although it is a prime tourist spot. Our driver in Siem Reap had lost a brother and 2 sisters to the Khmer Rouge, and said he really hated them. The walking wounded and scarred people in the city bear testimony that the 25% of the population killed by the Khmer Rouge were not their only victims. The People - As most places in the world, the Cambodians were very friendly to us and seemed to be relatively happy, despite the hardships caused by 3 decades of turmoil. The country seems stable at the moment, and we recommend it highly as a tourist destination. Poverty - The country is struggling to develop, and has much poverty. This results in beggars at all tourist attractions, who are mostly very polite although persistent. One can not help them all, and each person must decide whether to share, and with whom. A thousand riel (¢30) helps, although it perpetuates the habit of begging. Visiting as a tourist is a help to the country as it employs drivers, guides, restaurant workers, and puts funds in the Government coffers. Legacy of Landmines - The newspaper headlines did not really prepare us for the reality of hundreds of people bearing body and face scars, and missing limbs from the landmines left by the Khmer Rouge and Vietnamese. Many are beggars, and more work at a variety of jobs. We feel the Government should probably have a strong affirmative action program to help ore of them, but it may not be able to afford it - this is a real problem that will continue until the country has been cleared of landmines. Start early - 0630 to 0700 is reasonable and you have more elbow room, and the light is better for pictures. Afternoon Photo Ops - as the sun gets low in the sky, it is cooler, the crowds thin again, and the light creates more dramatic pictures. Take Lots of Film - We probably overdid it, but we shot 28 rolls in 5 days. You can buy film everywhere, but we could not tell how it had been stored. Most Transaction are in US$ - Everyone uses US$ for transactions, and credit cards are rarely accepted. Change Some Currency to riel - The local currency can be used for low cost items, tips, and beggars. Exchange rate was 3800:1 while we were there, so 1000 riel bills were good for cyclo rides and donations to beggars. Take lots of $1 bills - Many souvenirs, postcard packs, and books were priced at $1 and we found we could never have too many of these. Count your change - Most people are honest, but several times we were short-changed, in one case by a major store chain. Bargain - All prices (except Government-controlled fees) are negotiable so we bargained as hard as we could, but we tried to not niggle over $0.25 that meant a lot more to the seller than to us. Beware of Hotel Prices - Our hotel charged $3 for sodas (less than $1 on the street), $2/minute for a local call (rather than the $0.15/minute on the street), and asked for $7/minute for a call to Thailand - we passed. In Siem Reap, many restaurants offer cultural shows of fair quality. The real Saturday-night special is Beatocello, a free concert of Bach music sponsored by Dr. Beat Richner, a Swiss doctor who has established a free hospital to treat Cambodian children. 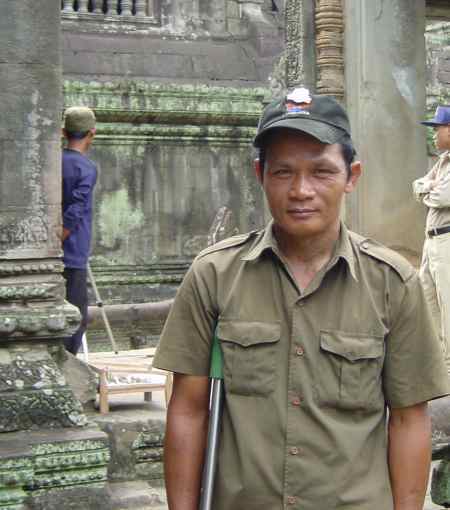 Tour Guide: We used a licensed guide by the name of Arun Sor; he spoke very good English and was very helpful. He can be contacted by mobile at (855)12 724 944 or by email at angkorsite202@yahoo.com.